Graduates of LTPH course or have played in a house program for 1 season to attend this full gear camp. And different weeks of camp for HOUSE players only! Options are 6 different weeks of camps each with a different level and age group. Full Day Campers/players will be on the ice from 9a-11am and again from 3p-5p. Total of 4 hours each day. Morning Campers/ players will be on the ice 9a-11a. Camp hours are 8:30a-5:30p. There will be Certified and Insured USA Hockey Coaches on the ice with the players. There will be 1-2 assistant coaches on the ice as well. Players skills to be worked on will include passing, edge work, stickhandling, shooting, technique with strides, agility, balance, transitions, quick starts and quick stops and more. 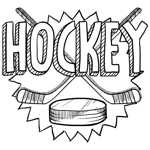 The off ice times all the hockey campers/players will be in the party room, outside and upstairs with the LTS campers/skaters for lunch, outside activities, field Trips Thursdays and rest or down time. The Haymarket Iceplex offers several Hockey Programs for all ages and all levels. for more information on the hockey program that is right for your player. How to skate for playing hockey ? Join a learn to skate class! Hockey skating classes are Mondays and Saturdays. Please see skating & lessons tab. Snow Plow Sam classes are for ages 3-6. The Hockey 1-2 & Hockey 3-4 class are for ages 7-18. Try Hockey For Free (THFF) sessions for ages 4-10 run will be held on two successive Saturday sessions. Our next session is scheduled for 4/27 and 5/4 2019 from 8:00-9:00am. Registration is now open. THFF is NOT for non-skaters. Participants must have a basic ability to skate on ice. Hockey gear will be provided for those ages 8 and under who do not have their own. We will attempt to fit out participants ages 9 and 10 but cannot guarantee that we have sufficient equipment at the sizes for these ages. Registrants will be contacted by email one week prior to the session with a request for skate's physical dimensions (Ht, Wt, Waist, shoe size) to permit setting up individual equipment "bags"; please arrive a minimum of 30- 45 minutes prior to the scheduled session time so that the fitting out can be completed in an orderly fashion and everyone can get on the ice at the beginning of the hour. LTPH1 is for kids who are serious about learning to play the game of ice hockey. Sessions include stick handling, skating, shooting skills and mini-scrimmages. A USA Hockey certified and/or a professional hockey instructor will conduct the course. It is recommended that registrants have basic experience in skating in hockey skates prior to enrolling. The coach/instructor will evaluate registrants at the first session and recommend additional instruction if necessary. At a minimum, LEARN TO SKATE Hockey 4 level course completion is necessary for success. LTS (Learn To Skate) lessons run every 7 weeks at Haymarket Iceplex on Mondays and Saturdays. LTPH1 is for ages 4-10. Sessions are 6 weeks in duration. Our next session begins on May 27, 2019 and runs through July 3 2019. Ice sessions are twice per week...Mondays and Wednesdays from 5:00-5:50pm of the North Rink of the Iceplex. Registration is open now and is limited to the first 15 skaters enrolled. Full hockey gear is required. To the extent possible the Iceplex will make hockey equipment available on a loan basis. Session schedules for LTPH2 will be available in early Spring, 2019. You asked for this...and here it is!! The Haymarket Iceplex is pleased to offer Learn to Play Hockey 11-17 for those boys and girls who have decided to join the world's finest sport in their tween/teen years. It's never too late to participate in the fastest game on earth. LTPH 11-17 joins our continuing popular LTPH 1 and LTPH 2 programs designed for the 4-10 year-old age groups. Our next LTHP 11-17 session is scheduled for 7/15 - 8/21 2019. The LTPH 11-17 instruction set will advance the existing basic ice skating skills of the participants and add core hockey skills (puckhandling, shooting, passing, working as a team). Completion will provide ease of integration into age-specific house hockey programs in the 12U-18U age ranges. For those who wish only to participate in Stick and Shoot and/or Pick-Up Hockey activities, this program will supply the skills to enjoy these activities. LTPH 11-17 sessions are 6 weeks induration with twice per week (Monday and Wednesday at 5:00-5:50pm) ice times. The fee is $195. The Haymarket Iceplex holds Stick n Shoot sessions as ice availability allows. In addition to open Stick n Shoot sessions, Youth Stick n Shoot times specific for ages 12 and Under are periodically scheduled; we ask that you respect the age limit for these events for the sake of player safety . Stick n Shoot times are listed on our rink calendar. Private or semi-private lessons for hockey players. These are usually done on the early morning open stick n shoot ice.